Supersonics Piano review - fun music for piano students! As a piano teacher, I am always looking for fresh new piano music for my students, either to spice up a recital or to encourage a student who may be starting to lose interest in piano and/or practicing. Well, not only did I find a collection that I love, but, more importantly, I found a collection that my students love! Even my own children love listening and dancing to it. My three year old happens to know the names to most of the songs in this collection now because he likes the songs that much. So what is this magical music I speak of? 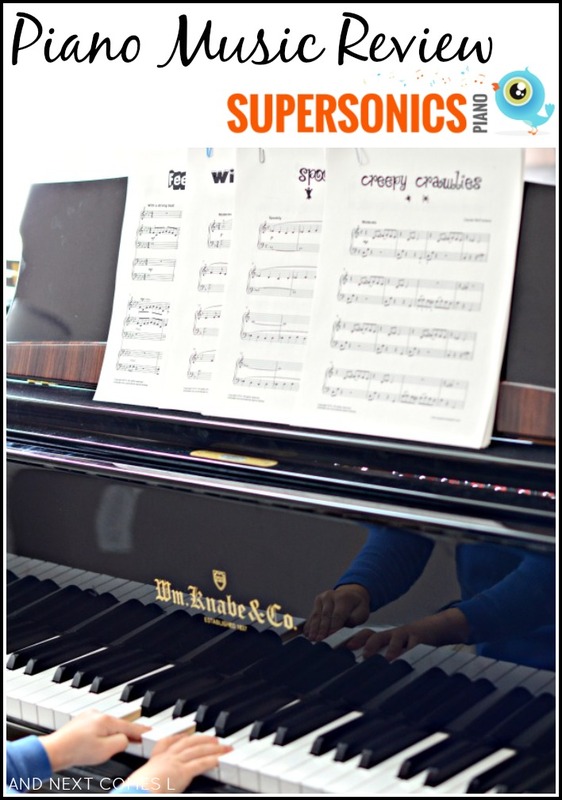 If you are a fellow piano teacher and are looking to add to your music library, then you will want to check out Supersonics Piano! Or perhaps you are a parent struggling to encourage your child to practice? Or maybe you are a parent looking for a great gift for a piano teacher? Well, then Supersonics Piano is going to be a great fit for you too! This post contains affiliate links for your convenience. I was provided with music from Supersonics Piano in exchange for a honest review. All opinions are mine and were not influenced by the free goodies. The first thing that I noticed about Supersonics Piano's website was how well organized it was. Not only can I preview all of the songs, but I can actually listen to them beforehand. How handy is that as a piano teacher? It sure beats (pun, intended!) picking up a piece of music at the music store and looking at it, wondering what it may or may not sound like. As a teacher, I loved the variety of technical aspects presented in the songs throughout all three books. From fun glissandos to odd time signatures to tricky rhythms, there is certainly enough to challenge piano students. But since the songs are so fun to play, the students are easily motivated to practice them, despite their technical challenges. If you are a non-musical parent that just said, "Ummm...what? ", I'm basically saying the songs are fun to play, teach lots of cool things, and your kids will actually want to play the songs. Sounds good, right? Piano pieces with catchy tunes and fun titles that capture the mood of the piece. A handy-dandy website that lets you preview and hear what the song sounds like before you purchase. Music that is easy to teach and that kids will actually enjoy practicing. Books that present a wide variety of songs, rhythms, and technical demands. The option to purchase a studio license that allows me to print off as many copies as I want for my students. Also, the studio license gives you the option to get customized song titles to further motivate students. So "I'm Grumpy" could be changed to "Dyan's Grumpy." And finally, the big reason that I love Supersonics Piano...I actually enjoy playing the pieces myself. I just find Daniel's jazz-inspired songs so much fun to play. You know it's got to be good when the teacher wants to play it and keep it all to herself, right? Yeah...definitely a good sign. And good thing I have a studio license so that I can keep a copy for myself and share other copies with my students. We have a very special music teacher who's my daughter's piano teacher and we'd love to give this to her as a special treat. She does so much for her students. Sounds like your daughter has a fantastic teacher! Hopefully you can surprise her with this for Christmas! I think it would be an extra incentive for my kids (and me) to practice! Oh yes! Like I said, I like playing these songs a lot. What a great opportunity! I would love to win this package as I plan to start teaching my 7yo piano lessons at home this year! I am very excited! Thanks for the chance! Sounds like a perfect fit for you! Thanks for entering. I have a studio of 23 piano students...and a number of them have been enjoying Daniel McFarlane's music. I must add that "Monsoon" by Daniel McFarlane was the biggest hit at my christmas recital. So many students said they wanted to learn to play that! I will have to check that song out! I would love this for my daughter, who loves music, and I really want to help develop that talent. Your daughter will love this music! This would be a wonderful resource to win. I'm looking forward to be able to introduce new music to inquiring minds! I teach one student now and will be teaching 3 more in the spring. Thanks for posting about this new series of music. Sounds exciting-would be great to add to my library. Having those backing tracks would be handy!